From C.T. Lamont Primary Healthcare Research Centre, Bruyère Research Institute, Ottawa, Ontario, Canada (CL, IM, AM); Department of Family Medicine, University of Ottawa, Ottawa, Ontario, Canada (CL); Department of Medicine, University of Ottawa, Ottawa, Ontario, Canada (EK); Division of Endocrinology/Metabolism, The Ottawa Hospital, Ottawa, Ontario, Canada (EK). Introduction: Excessive wait times for specialist care are a significant issue in many countries. Electronic consultation (eConsult) services have demonstrated the ability to improve access to specialist care. In this article, we evaluated the implementation of a successful eConsult service in a new jurisdiction to test its generalizability. Methods: We used a multimethod approach to evaluate the Champlain Building Access to Specialists through eConsultation eConsult service's implementation in the South East Local Health Integration Network of Ontario, Canada. Our quantitative analysis drew on use data collected automatically by the service and survey responses completed between February 1, and June 15, 2017. For our qualitative analysis, we conducted a thematic analysis of 3 focus groups with primary care providers and specialists participating in the pilot study. Results: Forty-nine out of the potential 219 primary care providers in Kingston submitted 301 cases to 24 specialty groups during the study period. Monthly case volume grew from 15 in February to 90 in May. The most frequently requested specialties included dermatology (n = 59), cardiology (n = 27), and gastroenterology (n = 26). Specialists responded in a median of 2 days, and a referral was originally contemplated but ultimately avoided in 40% of cases. Providers spoke positively of the service, citing high levels of satisfaction, enhanced collegiality, increased trust, and improved patient flow. Conclusions: Adoption of the eConsult service in the South East Local Health Integration Network was successful. The service exceeded all adoption targets, and the number of completed cases demonstrated a consistently upward trend, suggesting continued growth beyond the study's duration. The service's rate of adoption, high levels of satisfaction, and use data similar to other regions all demonstrate eConsult's generalizability. Our team implemented an eConsult service in the Champlain Local Health Integration Network (LHIN), a health region situated in eastern Ontario, Canada. Initially launched as a small proof-of-concept service, it expanded to a full pilot in 2011 and is now supported by provincial and regional funding. Given the service's success in our region,23,24 we have engaged in efforts to expand eConsult on a provincial level. To assess eConsult's generalizability, we partnered with Ontario Telemedicine Network (OTN) and OntarioMD to replicate the Building Access to Specialists through eConsultation (BASE) eConsult model in a neighboring LHIN (ie, health region) by using OTN′s existing platform. In this article, we have evaluated the implementation of an eConsult service in the South East LHIN through a combination of use data and focus groups to paint a broad and holistic picture of the service's expansion. Our findings will be of interest to innovators looking to implement or expand their own eConsult services. We used a multimethod approach to evaluate the impact of eConsult's implementation in the South East LHIN, including quantitative use data and qualitative focus group data. The Southeastern Ontario Academic Medical Organization (SEAMO) was motivated to champion eConsult's implementation in their region and assumed the role of the local host organization for the pilot. SEAMO is an association whose members are the Clinical Teachers' Association of Queen's University, the Kingston Health Sciences Centre, Providence Care, and Queen's University. The Champlain BASE eConsult service is a secure web-based platform that can be accessed through any device with a web browser. To use the service, PCPs log in and enter their question into a free-text field, attaching any items they deem might aid the specialist in their response (eg, images and test results). PCPs select a specialty group and submit the case, which is allocated to an appropriate specialist by a case assigner. The specialist has 1 week to respond with advice on treatment, a recommendation for a referral, or a request for more information. Conversation can continue back and forth until the PCP closes the case. Our study drew on data from 2 sources: use data automatically collected by the service and focus groups conducted with enrolled providers. Routine use data were collected automatically in real time and included the number of eConsults the PCP has submitted, the specialty group referred to, specialist response time and self-reported time taken to answer the case, and PCP time to close the case. Case outcomes for impact analysis were collected through a brief 5-field closeout survey completed by PCPs on the conclusion of each case (see Appendix A). The survey asked PCPs to assess (1) the outcome of the eConsult for the patient, (2) whether or not a referral was contemplated before/after the eConsult, (3) the helpfulness/educational value of the response in guiding PCP's ongoing evaluation or management of the patient, (4) the value of the response in addressing an important clinical problem that should be incorporated into upcoming continuing medical education events, and (5) any additional comments they may have on the service. Descriptive statistics were used to characterize the use data collected. Three focus groups were held to investigate the perspectives and experiences of the PCPs and specialists participating in the pilot study. The groups were held on Tuesday, June 20, 2017 in Kingston, ON, and consisted of 7 to 12 participants each. It was determined that the experience would provide a beneficial opportunity for PCPs and specialists to hear each other's experiences, roles, and perspectives in the eConsult process. Thus, PCPs and specialists were invited to jointly attend a session. Sampling was purposive: participants who had submitted/responded to at least 1 eConsult throughout the pilot were invited to attend through an e-mail sent by the SEAMO team. No relationship existed between participants and focus group leaders before study commencement. Three 2-hour session times were offered to participants, with 2 being in person and as a teleconference session for those who were unable to attend in person. The sessions were moderated by the lead physicians of the Champlain BASE eConsult team: a family physician and a specialist physician. A 14-question script used in previous focus groups was modified and adjusted to provoke discussion among participants (see Appendix B). The sessions were audio recorded, transcribed, and uploaded to NVivo to facilitate qualitative analysis. Verbal consent was obtained by focus group participants in the recording of the sessions. The targets and performance measures for the project were determined with the project partners and were based on projections from initial work done in Champlain LHIN23 and from a subsequent replication in the Mississauga Halton LHIN.26 The collaborating partners agreed on a work plan for implementing an eConsult service on the OTN′s existing provincial platform and set the targets to achieve within 6 months of implementation. The scope and targeted numbers was limited based on the funding allocation and spending rules and required reporting dates. Descriptive statistics were used to characterize the use data collected from February 1 to June 15, 2017. Findings were compared with adoption targets for the number of referrers, specialty services offered, and eConsults submitted, which were determined by the leadership teams before launching the pilot. Focus group data were thematically analyzed using NVivo software. The data were coded by 1 reviewer, which was then reviewed by and discussed with 2 other team members to further develop themes. A second thorough review was conducted by another team member to ensure rigor. The developed themes were circulated for feedback with the collaborators involved in the pilot. The Ottawa Health Science Network and Bruyère Research Ethics Boards provided ethics approval for this study. Adoption of the eConsult service surpassed adoption targets, and the top specialties requested aligned with the top priorities as identified by SEAMO (Table 1). User adoption exceeded the expected target of 40 referrers, with 49 of the potential 219 PCPs practicing in Kingston submitting at least 1 eConsult (a median number of 5 eConsults submitted per PCP). The majority of participating PCPs came from the targeted Queen's Family Health Team (n = 21) and other Family Health Teams and several independent practices in Kingston and the surrounding area as shown in Figure 1. Distribution of primary care practices that participated in the Southeastern Ontario Academic Medical Organization (SEAMO) pilot of the Champlain Building Access to Specialists through eConsultation (BASE) eConsult service. There were 301 cases submitted to 24 specialty groups from February 1 to June 15, 2017, of which 263 were deemed completed by PCPs as of June 15th, and 249 had completed closeout surveys (the remaining cases were completed and surveys sent after the June 15th cutoff). The number of submitted cases was more than double the expected target of eConsult cases. As shown in Figure 2, the volume of eConsults submitted by the PCPs increased each month, from 15 in February to 90 in May (the last month with complete data). The median number of eConsults submitted over the course of the pilot was 5, with an interquartile range of 2 to 9. 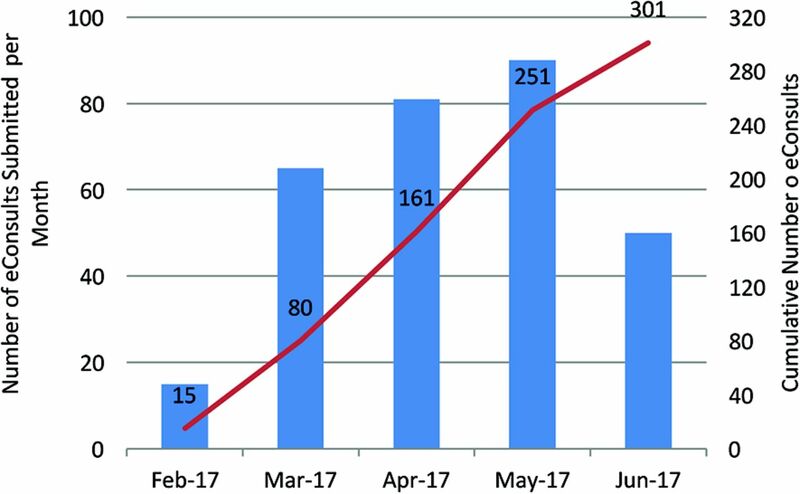 The number of cases submitted through the Champlain Building Access to Specialists through eConsultation (BASE) eConsult service by participants in the Southeastern Ontario Academic Medical Organization (SEAMO) pilot, by month and cumulatively. Available specialty groups align well with those identified by SEAMO as their top 10 priorities, with dermatology (n = 59), cardiology (n = 27), gastroenterology (n = 26), endocrinology (n = 21), neurology (n = 21), and hematology (n = 20) being the top 6 most requested specialties. Specialists provided an initial response to PCP questions in a median of 2 days, with 75% of eConsults answered within 4 days. In 6% of cases (16/263), the specialists took longer to respond than the prescribed 7-day response period. The self-reported time it took the specialists to complete the eConsult was less than 10 minutes in 32% of cases, 10 to 20 minutes in 53% of cases, and more than 20 minutes in 15% of cases. PCPs closed eConsult cases (eg, received and read response) in a median of 6 days, with 75% of cases completed within 10 days. Overall, PCPs received advice on a new or additional course of action in 61% (153/249) of cases and confirmed their original course of action in 35% (86/249). Only 2% (4/249) of responses were deemed not to be useful. In 40% of cases, a referral was originally contemplated but ultimately avoided. In 18% of cases a referral was not originally contemplated and was still not needed. Overall, 58% of all completed cases did not require a face-to-face visit. In 32% of cases, a referral was originally contemplated and was still needed, but the PCP perceived that eConsult would lead to a more effective specialist visit. In 4% of cases, a referral was not originally contemplated, but eConsult resulted in a referral being initiated. The closeout survey question asking PCPs to rate the service's helpfulness and/or educational value used a 5-point Likert scale ranging from 1 (minimal) to 5 (very valuable). PCPs rated the service at 4 or 5 (indicating valuable and very valuable) in 92% of cases. Whether the eConsult addresses an important clinical problem that should be incorporated into upcoming continuing medical education events was rated on a scale from 1 (strongly disagree) to 5 (strongly agree). Ratings of 4 or 5 were given in 50% of cases. Examples of free-text responses from PCPs regarding the benefits of the eConsult system and suggestions for improvement are given in Table 2. A total of 11 PCPs and 19 specialists participated in the 3 focus groups, representing a variety of clinics and practices. Participating PCPs represented 4 Family Health Teams and 1 independent practice. Participating specialists represented 11 specialty services: respirology; anesthesiology/chronic pain management; ear, nose, and throat; endocrinology; cardiology; physical medicine and rehabilitation; neurology; urology; dermatology; obstetrics and gynecology; and ophthalmology. Three themes emerged from the focus group discussions: description of the process, benefits of eConsult, and organization of the service. Participants' discussions of the eConsult process involved a number of factors, including registration and setup, platform, workflow, quality of eConsults, and engaging patients. The majority of participants found the registration and setup process straightforward. Some participants described joining the service on their own, although most joined during group onboarding sessions. One of the chief benefits of the group onboarding session, according to participants, was having an expert there to walk through the process in person: “I thought it was really helpful that someone came [to the clinic] at a time that was prearranged and walk us through the whole process.” A few participants encountered technical issues that caused short-term frustration but were ultimately resolved. When you think of 1 condition, you know, ‘this patient has this thing.’ But the patients we have and that you refer about, have 55 things wrong with them, all competing. It is a very specific thing because of all the complexity of these multiple overlapping issues, whether it be treatments or diseases. Several participants described how they engaged patients in the eConsult process. In most cases, participants discussed the eConsult with patients before sending it, although some described cases where the patient was unaware of the eConsult until they received the results. On receiving an answer to the eConsult, most participants contacted patients by telephone or communicated the results at a follow-up visit. Participants cited a number of benefits of using eConsult, including improved access to specialist advice, avoiding unnecessary referrals, education, expanded scope of practice, improved care for rural and underserved populations, and increased patient and provider satisfaction. Several participants stated that eConsult had allowed patients to avoid unnecessary specialist referrals. One participant described a case where a patient had wanted a second opinion regarding a prescribed ankle surgery, which the participant was able to secure via eConsult. Had he referred using the traditional method, the patient would have likely waited months for a response, delaying his ability to seek treatment. Even in cases where a referral was ultimately needed, participants agreed that eConsult still had value, as it allowed providers to ensure the patient saw the right specialist and had the necessary work-up before the appointment. A recurring theme among participants' discussions of eConsult was its educational value. Several participants who worked in primary care practices stated that sending eConsults and reading specialists' replies had provided them with knowledge they could apply to other patients in the future. These participants also praised the extra effort specialists made to provide educational materials, such as studies or guidelines, and noted that eConsults “often spark discussion points with the residents as well and can actually be a segue into a really nice educational opportunity for all us.” Several participants mentioned that eConsult cases could be used to inform continuing medical education curricula. My impression from previous conversations with family physicians is that they really want to look after those patients because they have a relationship with them and they want to maintain it. […] The concept of shared care, where we use the eConsult to provide the information that you need and let you carry on and knowing that if it does not work out you can just send them back or whatever, to me that makes a lot of sense. When discussing eConsult's ability to improve access and avoid unnecessary referrals, participants emphasized that these benefits were particularly valuable for patients from remote or underserved populations. Several participants raised the example of rural patients, many of whom face financial or geographic limitations in their ability to travel to urban centers where specialists often practice. One participant described seeing patients who had traveled from remote northern communities by plane for care that could easily have been offered through eConsult: “it is crazy the cost of sending these people down here. I just go what, are you kidding? […] They are going to fly them all the way down from James Bay and then they are just treating them with diet?” Participants also recommended focusing on “not just patient location but patient characteristic,” citing patients with low socioeconomic status, cognitive issues, or those incarcerated in penitentiaries as groups who could benefit from eConsult. Lastly, participants discussed their attitudes and preferences toward how the service is organized and offered suggestions as to how it should adapt when expanding the service province-wide. Subthemes in this area were governance, remuneration, specialties available, volume of cases, and community of practice. There's a big difference between an eConsult that comes from someone you know to someone you know, versus sending it into the ether. When I've been doing these and everyone's name pops up, it is, like, “hey, I know that person.” […] but if it is coming from North Bay, I may not feel that same enthusiasm. A few participants made suggestions about the types of specialty groups available through eConsult, and ways to expand the service's utility. One participant suggested adding midwives to the service, while another raised the possibility of specialist to specialist referrals. Participants noted that allowing multidisciplinary teams to collaborate on a patient's case would benefit patients with complex conditions requiring care from multiple providers. Clinics in the South East LHIN successfully adopted eConsult, with all target numbers for user adoption being surpassed within 4.5 months of the pilot being launched. Providers spoke positively of the service, citing high levels of patient satisfaction. The recruitment of PCPs and specialists together, maintaining the community of practice, was highly appreciated, with participants describing advantages, such as enhanced collegiality, increased trust, and facilitated patient flow. Specialists responded to PCPs in a median of 2 days, and 40% of cases resulted in PCPs avoiding a referral they had originally considered. These findings closely resemble those of studies conducted in other regions where eConsult has been implemented. For example, our earlier studies of PCPs and specialists participating in eConsult service in Champlain LHIN revealed that all providers recognized and appreciated the educational value of eConsult and often cited it as a motivator for continuing to participate.22,27 The direct communication between PCPs and specialists enabled by eConsult is often missing in the traditional face-to-face consultations and has been found to improve dialog between PCPs and specialists and maximize the efficiency, safety, and quality of specialty health care delivery within a patient-centered medical home-neighborhood.18 A study of eConsult's implementation in the Mississauga Halton LHIN found a median response time of 1.1 days, whereas an examination of all cases completed over the first 5 years of the service (over 14,000 in total) revealed a median response time of 0.9 days. The rate of unnecessary referral avoidance remained unchanged at 40% across all 3 studies. The consistency of these findings showcases the service's generalizability across multiple settings. The challenges associated with scaling up health care innovations are well-reported.28 Researchers have pinpointed several barriers to scale-up, including providers' reluctance to change behaviors in care delivery,29 difficulties spreading knowledge within organizations,30,31 and limitations of infrastructure.32 This is especially true in Canada, which has been described as a “land of perpetual pilot projects,” in which promising innovations are implemented at considerable cost only to languish at a regional level, unable to expand beyond the pilot phase.33,34 This trend is costly, as innovations must continually shoulder the up-front expenses of implementation and results in new knowledge remaining siloed and unavailable to a wider audience that could benefit from it.34 Given these issues, our findings are encouraging, as they suggest a high level of generalizability for eConsult and can serve as a valuable blueprint for expansion to new jurisdictions. However, it is worth noting several limitations when attempting this interpretation. Implementation at both sites occurred within the same province, which makes it unable to account for the challenges associated with interprovincial expansion.33 Furthermore, implementation relied on an academic lead site, which may be more responsive to innovations and will not be available in all contexts. Methodological limitations related to study duration and selection of focus group participants with inherent selection and desirability biases must be also acknowledged. Our team is aware of the challenges associated with eConsult's expansion and has previously examined the Canadian policy landscape to identify areas where legislation could impede eConsult's growth, revealing 3 aspects of concern: payment, privacy, and interjurisdictional licensing.35 In an effort to overcome these obstacles, we applied an integrated knowledge translation strategy that culminated in a National eConsult Policy Think Tank, which convened experts and stakeholders from 9 Canadian provinces/territories.36 It is our hope that these efforts will support the further expansion of the service to new jurisdictions across Canada. Adoption of the eConsult service in the South East LHIN was successful. The service exceeded all adoption targets, and the number of completed cases demonstrated a consistently upward trend, suggesting continued growth beyond the study's duration. The service's rate of adoption, high levels of provider satisfaction, and usage data similar to other regions all demonstrate eConsult's generalizability. The authors wish to thank the PCPs and specialists who participated in the service; Lacey Cranston, Danielle Claus, and Gina Johar for their assistance in expanding eConsult to the South East LHIN and conducting the study; and Justin Joschko for his help with drafting the manuscript and preparing it for publication. Q1: Which of the following best describes the outcome of this eConsultation for your patient? Q3: How helpful and/or educational was this response in guiding your ongoing evaluation or management of the patient? Funding: Funding for this study was provided by OntarioMD, the Ontario Ministry of Health and Long-Term Care, Ontario Telemedicine Network, the South East LHIN, and the Canadian Institutes for Health Research. The funders had no role in study design, data collection/analysis/interpretation, or preparation of the manuscript. To see this article online, please go to: http://jabfm.org/content/32/2/146.full. Received for publication June 7, 2018. Revision received November 8, 2018. Canadian Institute for Health Information. How Canada compares: results from The Commonwealth Fund's 2016 international health policy survey of adults in 11 countries. Available from: https://www.cihi.ca/sites/default/files/document/text-alternative-version-2016-cmwf-en-web.pdf. Published 2017. Accessed May 4, 2018.
. Mirror, mirror 2017: international comparison reflects flaws and opportunities for better U.S. health care. New York: The Commonwealth Fund; 2017.
. Access to specialty care and medical services in community health centers. Health Aff 2007;26:1459–68.
. In 2011 nearly one-third of physicians said they would not accept new Medicaid patients, but rising fees may help. Health Aff (Millwood) 2012;31:1673–9. Canadian Institute for Health Information. Health Care in Canada, 2012: a focus on wait times. Ottawa: Canadian Institute for Health Information; 2012.
. The consequences of waiting. In: Globerman S, editor. Reducing wait times for health care: what Canada can learn from theory and international experience. Vancouver, BC: Fraser Institute; 2013. P. 45–76.
. Improving patient access to medical services: preventing the patient from being lost in translation. Healthc Q 2009;13:61–8.
. Corridor conversations: clinical communication in casual spaces. In: Iedema R, editor. The discourse of hospital communication. Springer; 2007. P. 182–200.
. Dropping the baton: specialty referrals in the United States. Milbank Q 2011;89:39–68.
. Referral and consultation communication between primary care and specialist physicians: finding common ground. Arch Int Med 2011;171:56–65.
. Variation in GP referral rates: what can we learn from the literature? Fam Pract 2000;17:462–71.
. Patient, physician, and community factors affecting referrals to specialists in Ontario, Canada: a population-based, multi-level modelling approach. Med Care 2003;41:500–11.
. Comparison of specialty referral rates in the United Kingdom and the United States: retrospective cohort analysis. BMJ 2002;325:370–1.
. Primary care physician specialty referral decision making: patient, physician, and health care system determinants. Med Decis Making 2006;26:76–85.
. What do we actually know about the referral process? Br J Gen Pract 2011;61:752–3.
. Performance measures of the specialty referral process: a systematic review of the literature. BMC Health Serv Res 2011;11:1.
. Providing specialty consultant expertise to primary care: an expanding spectrum of modalities. Mayo Clin Proc 2014;89:1416–1426.
. Leveraging an electronic referral system to build a medical neighborhood. Healthc (Amst) 2015;3:202–8.
. Electronic consultation systems: worldwide prevalence and their impact on patient care—a systematic review. Fam Pract 2016;33:274–85.
. Electronic consultations (e-consults) to improve access to specialty care: a systematic review and narrative synthesis. J Telemed Telecare 2015;21:323–30.
. Unique educational opportunities arising from electronic consultation services. Acad Med 2017;92:45–51.
. Impact and satisfaction with a new eConsult service: a mixed methods study of primary care providers. J Am Board Fam Med 2015;28:394–403.
. Utilization, benefits, and impact of an e-consultation service across diverse specialties and primary care providers. J Telemed E Health 2013;19:733–8.
. Just a click away: exploring patients' perspectives on receiving care through the Champlain BASE eConsult service. Fam Pract 2018;35:93–8. Ontario Physician Human Resources Data Centre. Physicians in Ontario 2015: Report from the Active Physician Registry. Available from: http://www.ophrdc.org/wp-content/uploads/2016/08/2015-Annual-Report-Physicians-in-ONTARIO-PIO.pdf. Published August 2015. Accessed October 4, 2018.
. Evaluating the implementation of the Champlain BASE eConsult Service in a new region of Ontario, Canada: a cross-sectional study. Healthc Pol 2017;13:79–95.
. Perspectives of Champlain BASE specialist physicians: their motivation, experiences and recommendations for providing eConsultations to primary care providers. Stud Health Technol Inform 2015;209:38–45.
. From best evidence to best practice: effective implementation of change in patients' care. Lancet 2003;362:1225–30.
. Diffusion of Innovations. New York: Free Press; 2003.
. Disseminating innovations in health care. JAMA 2003;289:1969–75.
. Lessons from developing nations on improving health care. BMJ 328:1124, 2004.
. A country of perpetual pilot projects. Can Med Assoc J 180:1185, 2009.
. Unleashing innovation: excellent healthcare for Canada: report of the advisory panel on healthcare innovation. Ottawa, ON: Government of Canada; 2015.
. Policy innovation is needed to match health care delivery reform: the story of the Champlain BASE eConsult service. Health Reform Observer 2015;3:1–11.
. Using an integrated knowledge translation (IKT) approach to enable policy change for electronic consultations in Canada. Healthc Policy 2018;14:19–29.